We’d love your help. Let us know what’s wrong with this preview of The First Billion by Christopher Reich. the truth is even more diabolical than he can imagine. Plunging into a desperate search for his best friend, the renegade top gun is suddenly fighting a different kind of war, where there is no safe harbor and no one he can trust. Not Konstantin Kirov, the elusive head of Mercury Broadband who may not be what he seems. Not the bankers and traders Gavallan does business with every day. Not the exotic beauty who has told him all her deepest secrets--except one. Suddenly Jett finds himself trapped in a conspiracy that could shatter the delicate balance between nations--and plunge the global economy into chaos. Hunted by the F.B.I. and a band of elite killers, Jett races from Palm Beach to Zurich to Moscow in a desperate search for answers. But for this brave ex-commando haunted by visions of war, the truth comes at a terrible price. With Mercury rising and the hours ticking down, he is moving closer to a place where murder and revenge are the currency of choice...and where the first billion is the ultimate insider secret--and the deadliest obsession of all. With breakneck plotting, stunning realism, and a sense of danger that keeps the heart racing, The First Billion is a knockout of a novel that will linger long after the final shocking twist is revealed. To ask other readers questions about The First Billion, please sign up. Was surprised I enjoyed this as much as I did (perhaps because I bought it for a quarter as an old used library book). This is a great thriller that was really hard to put down. This review has been hidden because it contains spoilers. To view it, click here. Book is boring. It failed to engage me, and two main problems come to mind. First, the characters are uninspired. John “Jett” Gavallan is the protagonist. His personal history is spotty: grew up poor in Texas near the Mexican border; joined the Air Force and flew stealth bombers; founded and heads Black Jet Securities, a small investment bank out of San Francisco; about 45 years old; worth about $45 million; working to bring his latest IPO to the market, which is a Russian firm named Mercury. Hi Book is boring. It failed to engage me, and two main problems come to mind. First, the characters are uninspired. John “Jett” Gavallan is the protagonist. His personal history is spotty: grew up poor in Texas near the Mexican border; joined the Air Force and flew stealth bombers; founded and heads Black Jet Securities, a small investment bank out of San Francisco; about 45 years old; worth about $45 million; working to bring his latest IPO to the market, which is a Russian firm named Mercury. His love interest is Cate Magnus: mysterious; 29; beautiful; graduate of Choate, Wharton, and whatever other Ivies are supposed to impress. Konstantin Kirov is the bad guy: Russian head of Mercury; rich; evil; ruthless; trying to regain Russia’s former glory. Cool. None of the details are sufficiently fleshed out for me to believe Jett is an actual dude, Cate is an actual hottie, or that Kirov is actually someone to fear. And these were the main characters. There were perhaps a dozen more minor players: Kirov’s brother, Kirov’s enforcer, the president of Russia, a couple of FBI agents, Jett’s colleagues, a computer hacker, a corrupt Swiss banker, a rogue journalist, and it goes on. Too many people to care. Second, the story ineptly straddled genres of espionage, mystery, financial thriller, and political intrigue. It tried to do too much and ended up doing nothing. It lacked the levity to be a page-turner and the depth to be informative. Here are the broad plot strokes of this lethargic tale. Jett assembles a large IPO—initial public offering, i.e., the first time a company offers stock shares to the public—for the Russian internet company Mercury. Jett is suspicious of Mercury and so sends his friend, Grafton Byrnes, to Russia to investigate. Mercury’s head is the ambitious Kirov. He wants Russia to be great and he wants to be remembered for making it great again. He plans to do so by taking Mercury public. But Mercury actually isn’t so great. It doesn’t have sufficient revenue to justify a large, successful IPO. So Kirov captures Byrnes and holds him hostage to prevent the truth from leaking. He also cooks the books with the help of Swiss accountants and bankers. Kirov hopes that with the influx of funds, he will be able to use the first billion to make Mercury legitimate, and the second billion will go to the president of Russia for reasons unknown. (As if $1 billion would be sufficient to return Russia to superpower status.) With Byrnes missing and the IPO approaching, Jett goes to Switzerland with Cate Magnus to investigate. They discover Mercury is a sham, but Kirov’s henchmen capture them and take them to Russia. There, Jett learns Cate Magnus is actually Ekaterina Kirov, Konstantin Kirov’s daughter. Jett, Grafton, and Cate fight their way to freedom shortly before they were to be executed by Kirov’s men. The trio returns to America and stops the IPO just in time. Jett discovers one of his colleagues had been working undercover for Kirov the whole time, so Jett fires him. Kirov is captured by his own enforcer, who presumably kills Kirov because Kirov had been stealing from their joint partnership. Cate and Jett marry, have kids, and live happily ever after. God, I got bored just writing that. And I left out a lot of detail. The book is just too convoluted and slow to be enjoyable. My interest faded with each additional, undeveloped character. By the time big twists came, such as Cate being Kirov’s daughter, no one cares. THE FIRST BILLION by Christopher Reich is 10 cassettes in the audio version. It was read by James Daniels and is approximately 15 hours long. In exactly six days, Jett Gavallan will take Russia's top media company public on the New York Stock Exchange. A former fighter pilot and now the CEO of Black Jet Securities, Gavallan is no stranger to risk. But when rumors of fraud threaten to send the deal south - and with it everything Gavallan has worked so hard to build - he dispatches his THE FIRST BILLION by Christopher Reich is 10 cassettes in the audio version. It was read by James Daniels and is approximately 15 hours long. In exactly six days, Jett Gavallan will take Russia's top media company public on the New York Stock Exchange. A former fighter pilot and now the CEO of Black Jet Securities, Gavallan is no stranger to risk. But when rumors of fraud threaten to send the deal south - and with it everything Gavallan has worked so hard to build - he dispatches his number-two man to Moscow to penetrate the shadowy company. When Grafton Byrnes fails to return, Gavallan plunges into a desperate search for his friend, racing from Zurich to Moscow for answers. But for this brave ex-commando haunted by visions of war, the truth comes at a terrible price. With the hours ticking down, he is moving closer to a place where murder is the currency of choice...and where the first billion is the deadliest obsession of all. This book started out a little slow, but about half way through it had a lot of suspense with many twists and turns. James Daniel did a terrific job with the different accents because a good portion of the book took place in Russia. This has a lot to do with the financial world and the New York Stock Exchange with the launch of a new IPO on the market. The characters seemed to be very real except for one person. I am giving this 4 out of 5 stars because I thought it took a while to get it going. I would definitely read more books by this author as I was very impressed with the amount of detail that was given to this book. Interesting insight to the greedy IPO world and a nice mix with action and suspense; main character is a little too perfect and too rich....needed more flaws...puts entire fighter jet on AMEX....really! After numerous attempts to get into this book, I just gave up after about 140 pages. I know folks said it picks up after page 200, but why do we need to read 200 pages first. I enjoyed this one too! Quite a bit happening in it and it had some finance in it which always interests me. This is a 5 star novel if not for the muddled ending. 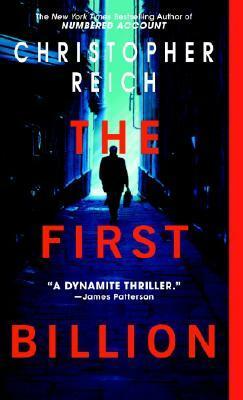 Christopher Reich has written a thriller full of intrigue and suspense. Gavallan is the CEO of an investment firm who has a deal with Kirov, a Russian oligarch (businessman!?!) to get Kirov's company (Mercury BroadBand) on the NYSE. He sends his #2 man to Moscow to check on the validity of Mercury, since a mysterious, anonymous reporter, publishes accounts of Kirov's underhanded ways. Gavallan's former girl friend, Cate, tries to convince him This is a 5 star novel if not for the muddled ending. Christopher Reich has written a thriller full of intrigue and suspense. Gavallan is the CEO of an investment firm who has a deal with Kirov, a Russian oligarch (businessman!?!) to get Kirov's company (Mercury BroadBand) on the NYSE. He sends his #2 man to Moscow to check on the validity of Mercury, since a mysterious, anonymous reporter, publishes accounts of Kirov's underhanded ways. Gavallan's former girl friend, Cate, tries to convince him that Kirov is evil and that his company will be hurt through his association with Kirov. All the while, the FBI is investigating Gavallan, thinking he is guilty of fraud, among other things! An entertaining read. Thrillers are my guilty pleasure. The First Billion had both plot and character development. Despite knowing nothing about finance or the stock market, I was engaged in the storyline and able to grasp the developments. I think Reich made it tangible for those of us who need it, without lecturing too long or boring those familiar with the world of finance. I like how Reich transitioned between storylines and characters, allowing me to get to know the personalities. A few parts An entertaining read. Thrillers are my guilty pleasure. A few parts were a bit rushed, but I would read another of his books. This book is easy 250 pages too long. The story intself is quite gripping and has enough twists and turns to make the reader curious about what will happen. The problems though lie in the narration. Way too many flashbacks. Like way way way too many in the first 100 pages itself. The number of characters and the amount of time spent in their own backstory/flashback narration is absolutely not needed. This book could have done better with a good editor. The book seems primed to be made as a serie This book is easy 250 pages too long. The story intself is quite gripping and has enough twists and turns to make the reader curious about what will happen. The problems though lie in the narration. Way too many flashbacks. Like way way way too many in the first 100 pages itself. The number of characters and the amount of time spent in their own backstory/flashback narration is absolutely not needed. This book could have done better with a good editor. Interesting premise and complex plot. I almost stopped reading after about 200 pages, with so much tedious character development and so little plot advancement. Decided to keep reading and found the next 200 pages worth the perseverance. Given the strength of the build-up, I thought the ending was a little weak, simplistic (especially choices by law enforcement), and anti-climactic. But still a good read -and I will try this author again. If you manage to survive to chapter 9, you will be rewarded with an entertaining plot. Not recommended to people who nitpick on details. Editing is atrocious and small mistakes galore. What self respecting editor allows his author to claim The Clash are a western band? another very good read! This author doesn't disappoint . So many subplots happening at the same time it was overwhelming. Some didn't really seem to add to the story and they didn't have enough detail to engage you. This review has been hidden because it contains spoilers. To view it, click here. This got off to a slow start. I'm a big Stephen Frey fan, and I thought Reich might be similar. He is, but the story just wasn't as tight and well-spun as a Frey "financial thriller." There were too many peripheral characters, and you sometimes would get a brief introduction to one and then go a couple hundred pages without hearing from them again, and then need to remember who they were. It was confusing. And the book is 578 pages, which is 150 pages too long. There were a ton of scenes that I w This got off to a slow start. I'm a big Stephen Frey fan, and I thought Reich might be similar. He is, but the story just wasn't as tight and well-spun as a Frey "financial thriller." And the book is 578 pages, which is 150 pages too long. There were a ton of scenes that I would have cut. But, overall a good read. Just not great. **EDIT: I've decided to add a spoiler in here because it annoyed me so much. There's a scene maybe halfway through where the protagonist - a man - is knocked unconscious by two Russians just as his girlfriend is entering the house. When he comes to, he's in his girlfriend's car and she claims that she walked in and there was no one there. I immediately wondered how she got him into the car. Seems like an obvious thing, right? Well, it turns into one of the books biggest twists - she was Russian, unbeknownst to her long-time boyfriend! And those Russians who knocked the protagonist out helped her get him into her car before they left. Christopher Reich was born in Tokyo. In 1965 his family moved to Los Angeles. He attended Georgetown University and the University of Texas and worked in Switzerland before returning to the United States to become an author. His novel The Patriots Club won the International Thriller Writers award for Best Novel in 2006. He lives in Encinitas, California.